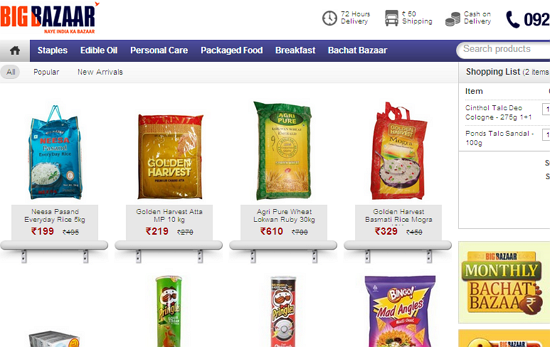 Big Bazaar is a famous retail store having 214 stores across 90 cities and towns in India. Big Bazaar offering a wide range of merchandise including fashion and apparels, food products, general merchandise, furniture, electronics, books, fast food and leisure and entertainment sections. Now Big Bazaar opens online store in Mumbai that means if you are living in Mumbai you can order items in online with out going to Bigbazaar stores. Your order will be delivered to your specified address within 72 hours. You have to pay Cash on delivery and now they are charging extra Rs.50 for delivery.